Ret. 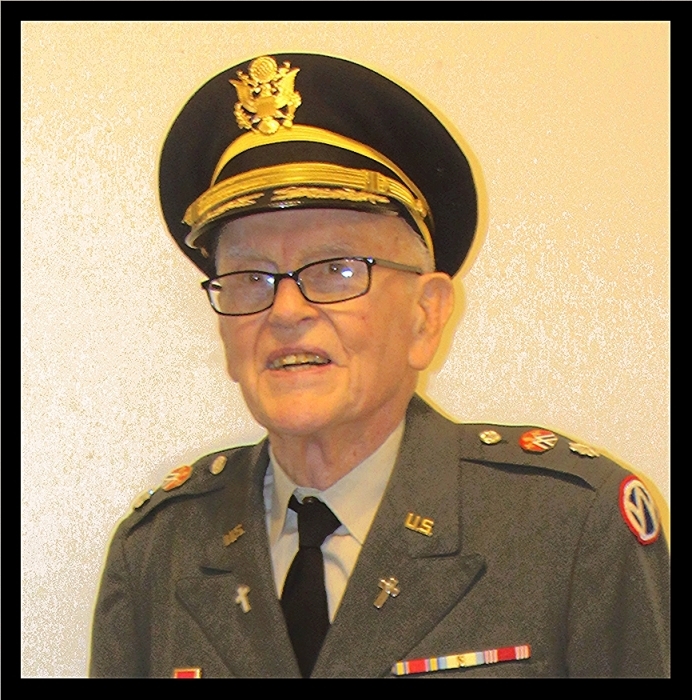 Lt. Col. U.S. Army, Reverend William “Bill” P., Moore, 91 years, and 13 days, of Nebraska City, Nebraska, passed away at the Ambassador, Nebraska City, Nebraska, on Monday, July 31, 2017. William "Bill" Moore was born to Ben and Mabel (Anderson) Moore, on the family farm south of Brownville, NE, on Sunday, July 18, 1926. In 1943, he had graduated from the Auburn High School and was drafted into the Army on May 8, 1945. After a year at Ag College at the University of Nebraska - Lincoln and after Victory over Japan Day he and 300 others, were shipped to Fort Meyer, VA, to serve as Military Police. After his active duty he volunteered for the reserve, being retired with 41 years of active and Reserve time. On June 4, 1948, he married Helen A. Softley in Lincoln, Nebraska. To their union they had three children; Lana Beth, Ronald, and William "Pat". Bill had graduated from University of Nebraska - Lincoln Department Agriculture College with a Dairy Major. After several years farming he became a Dairy Herdsman. In 1955, he entered Garrett Biblical College at the Northwester, IL, campus and began serving Sheridan Methodist Church and as Protestant Chaplain for the Illinois Training School at Sheridan, IL. The institution has since closed. In 1959, he received his degree, and appointment as chaplain in the US Army Reserve. He served three more churches in Illinois, before returning to Nebraska in 1971. After serving six church appointments in Nebraska, Bill and Helen retired to 301 No 11th Street in Nebraska City in 1991. In 2001, they reluctantly left their beloved "retirement" home for a smaller home surrendering most of their dolls and antiques. Bill had stayed active over the years, since retirement and served as Friend of Nuckolls Square, for the building of both gazebos and encouraging tree planting. He spent many Monday nights at City Council meetings. He leaves family, friends and military memories. Bill was preceded in death by his parents and a brother, Charles Moore. Bill is survived by his: wife of 69 yeas, Helen; daughter, Lana Armstrong and husband Hugh of Bluffton, SC; 2 sons, Ron Moore of Bloomington, IL, and Rev. William “Pat” Moore and wife Julie of St. Libory, NE. ; 6 grandchildren; 11 great grandchildren; 4 Step-great grandchildren; other relatives; and many friends.